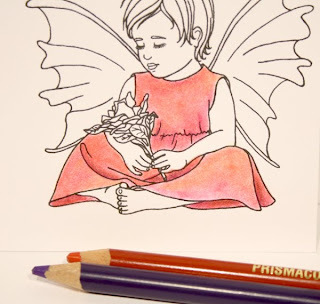 Roberta from Prarie Fairy has kindly given me permission to use her tutorial on Prisma Colour pencils. I thought it would be useful for those of us who are still learning with these pencils. Roberta reccommends Baby Oil instead of Sansador, it's cheaper too! Other supplies for blending you will want to consider are gamsol, odorless mineral spirits or baby oil. In the tutorial I use baby oil, my fave by far! 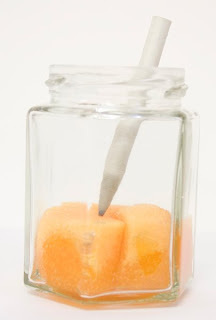 Use the blending stumps with these to create soft watercolor like effects. I put sponges in a jar with the baby oil and then just squish the blending stump into it. This is the fairy after I have put a soft layer of pink all over her dress. I then use some yellow in the warmer areas where there may me some light hitting the dress. I use red in the deeper colored areas. All applications are a soft layering application. In the darkest areas I use a purple to cool it off and deepen the shadows a little. I then use the blending stump and baby oil to rub the penciled areas to “melt” the crayon and create a soft water colored effect. I decided after I had blended it to deepen the shadows further with a little more red and a darker purple. You can do this, keep layering and blending. I love being able to do that without damaging the paper. When you use a blending pen you can damage the surface of the paper though so take it easy. And here is the finished fairy. Even though I used the baby oil my glue pen still works for adding glitter to the wings. Have fun layering colors to create new ones. You are save combining colors as long as you use colors next to each other on the color wheel. Eg. Use purple to cool down a red because red & blue make purple so purple is next to red on the color wheel. So is orange so you use orange or yellow to warm up red. In this picture I have taken an image that I colored with copics. My colors are very limited with my copics so I added some pencil crayon shading over top and blended it with the stump and baby oil to smooth out the look and punch up the vibrance. I am sure you can tell in the picture the circled areas are where I added the colored pencil. I also did the same to her raincoat. 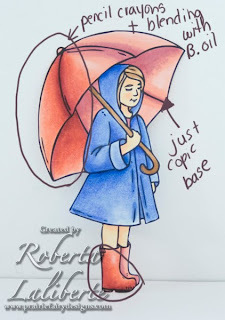 I hope this helps too, so if you have a little accident with blending your copics as they can be so fussy here is a little trick to fix it up. Oh yeah, had a good question. I use ctmh daisy white cardstock. 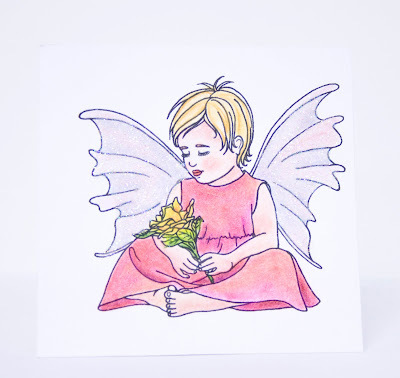 Stampin Up whisper white is fine too. 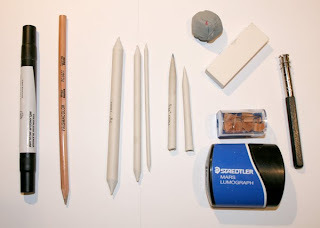 There are expensive rough papers for colored pencil techniques but if you are looking for a nice smooth copic marker look you want smooth paper. The trick is to buy GOOD QUALITY white cardstock. Don’t cheap out here. You want it to be at LEAST 80lbs with good sizing. Sizing is something they coat the paper with to give it a nice smooth surface so that pigments don’t soak in to quickly. If your paper is cheap anything you put on it will soak right in and look uneven. Cheap paper feels rough and looks rough. Good paper is smooth with a nice sheen to it. Digital images print better on them and have smoother edges. On cheap paper the image looks rough or burred. 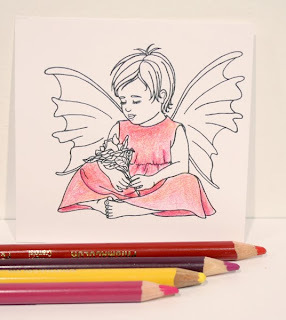 I hope you liked the tutorial and you decide to try having some fun with colored pencils. Baby oil even works well with Laurention colored pencils. This is my preferred method for coloring images. I also prefer baby oil to gamsol. Gamsol is alcohol based and can tear the paper if you over work the paper. The baby oil emulsifies the colored pencils and makes it possible for you to go back over time and time again to build rich layers. I have not had any trouble using gel pens over them either. You will need good quality colored pencils, I like prismacolor premiers. Blending stumps that you can get at any art supply store. blend in circular motion with stump and oil till you have a smooth finish! You could stop here. Light med and dark blue. Now watch. Add some reds and another layer of navy. A little more navy and some blending. At this stage the surface is so smooth you don’t even need any more baby oil. you could pretty much just use the plain stump after the second layer. Thanks for this Roberta, I for one will find it very useful. Oh this is wonderful Karen! Thanks so much for adding my tutorial here. It looks wonderful! This is really good and so easy to follow, would love to link you on my sidebar, so I can find you again! Fantastic tutorial. Just purchased my first set of Prismacolor Premier Pencils and this seems a much easier way to use them than what I have read using the Gamsol. Outside the Frame with Kate.